Nestlé Gerber has always been my go-to brand for great nutrition for babies and toddlers. When my kids were little, I couldn’t wait to start trying out delicious Gerber goodies on them. Let me tell you a secret: there were a few Gerber goodies that even I thought were pretty yummy. Now, they are proud to introduce a brand new delicious easy snack for your busy toddler: Gerber Arrowroot Biscuits. What makes Gerber Arrowroot Biscuits such a great snack for toddlers? First, it’s from Gerber, so you know it has to be good! One thing I love about these biscuits is that they contain no artificial colours, flavours or sweeteners. Your toddler doesn’t need all that processed stuff! I also love that each serving contains calcium, iron, zinc and Vitamin E.
The shape of a Gerber Arrowroot Biscuit is perfect for chubby little toddler hands too. 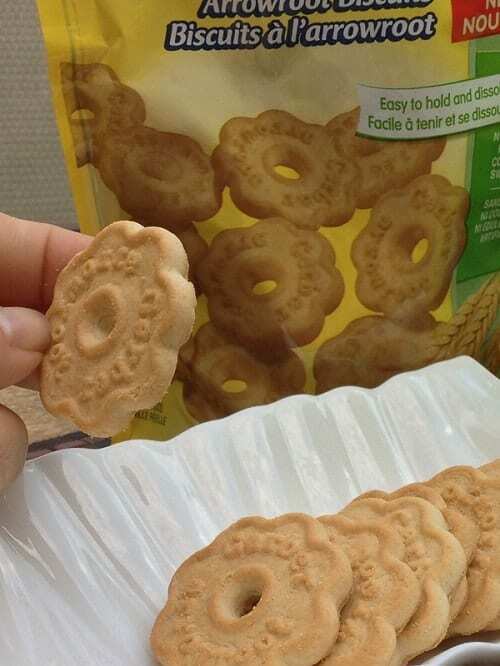 The biscuit is round with a hole in the middle. This makes it easy to grasp with fingers or a whole fist. Toddlers love doing things on their own. Giving them a biscuit that they can really hold onto helps toddlers feel more independent during snack time. Plus it frees your hands for other important tasks! We love that it’s made to dissolve quickly in your toddler’s mouth. It’s also easy enough to mash with their gums. Believe me, I tried this yummy snack, sshh.. don’t tell my kids! Delicious is just not enough: it melts in the mouth and is perfect to dip in your milk or favorite hot beverage! My kids loved every bite, even if they are no longer toddlers. My daughter was happy to bring it to school as a snack. She said her friends were eyeing her biscuits! Since the biscuits are made for kids 12 months and older, I gave some to my nephew who is 13 months of age. His mom said it was an easy grip for him and he loved to dip them in his milk too. It dissolved quickly but not too much for him to enjoy. It was dense enough for him to pick it up again with his little fingers rather than having to search for his biscuit in his milk cup. Perfect for dunking! No messy mush! Is your toddler ready for Gerber Arrowroot Biscuits? It’s so exciting to see your toddlers face as they discover a new flavor. As parents, we often want to broaden our child’s horizons as early as possible. This includes introducing new foods so that they can learn to love a variety of textures and flavors, but it’s important to make sure your toddler is actually ready for those different textures too! Standing alone and starting to walk. Feeding themselves with their fingers without too much of a challenge. Using their jaws to mash food with their gums. I think this is really the most important one! While Gerber Arrowroot Biscuits do dissolve quickly, it is important that your toddler knows how to actually mash food in their little mouths before introducing this type of snack. Biting through a variety of textures. Once you’re sure your toddler is ready, try giving her a taste of Gerber Arrowroot Biscuits! One trick I learned when I was trying to get my son to eat new things is to eat it myself in front of him. Thankfully, the Gerber Arrowroot Biscuit is yummy enough for parents too! 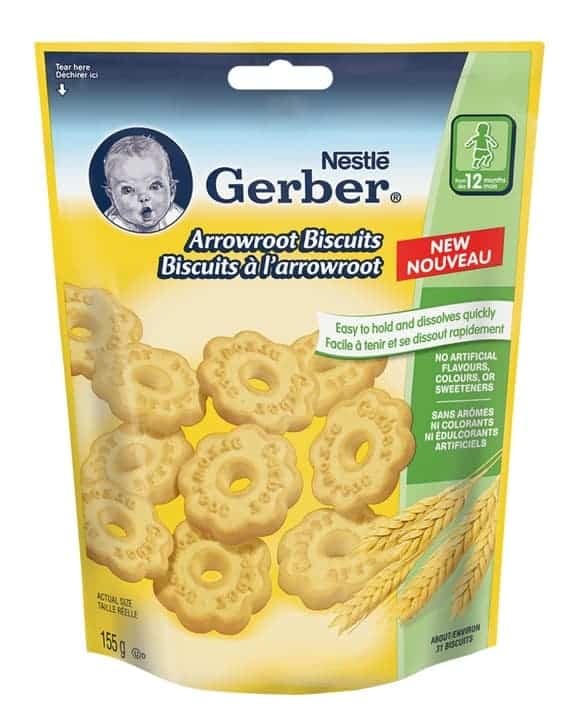 Starting this October (2013), you’ll be able to find Gerber Arrowroot Biscuits in food retailers across Canada where other Nestle Gerber products are sold. They will retail for $2.99 per bag. Visit Gerber Canada on Facebook to keep up with news! 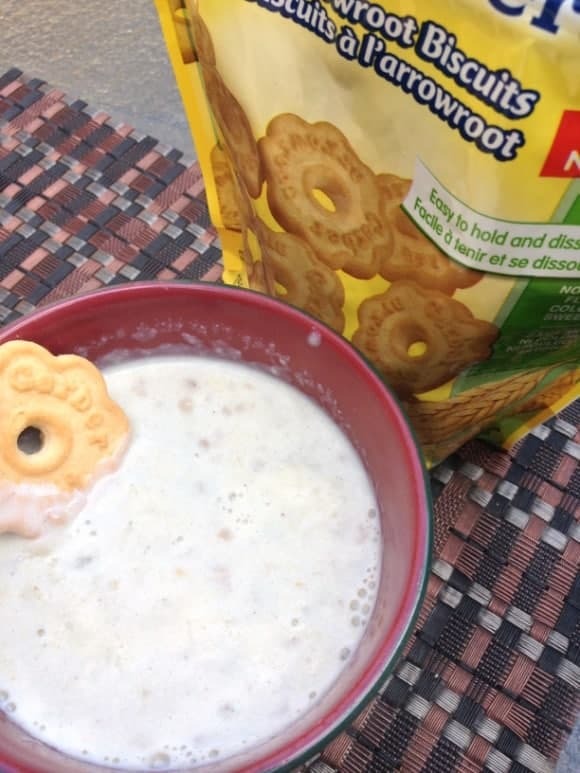 Will you try Gerber Arrowroot Biscuits with your toddler? What other Gerber products does your little one love? Thanks for sharing. I love that these are free of artificial colors and flavors! That’s so important for me! Looks like a great snack for little tots. Like a cookie —- but better! When my son was little, I often purchased Gerber snacks. These sound really great. These look like the perfect snack for teething babies!